NOTICE: Activation key must be used on a valid Steam account. 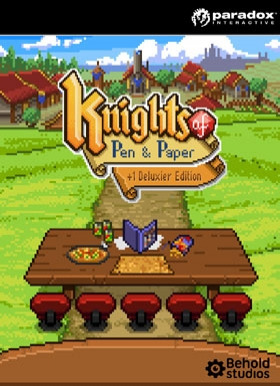 Requires internet connection.DELUXE EDITIONThe Deluxe Edition of Knights of Pen & Paper includes the following bonus items: Special Guest Character – A Yellow Wizard with passive MP +20. Farm Village Map – A new location that will allow players to farm experience efficiently no matter what stage in the game you’re at. Also inclu… des the exclusive Scarecrow monster! Sci-fi Pack for Bedroom – This gives players 4 exclusive items for their “in game real world room” Treasure Chest with 800 Gold – in-game gold that helps any new player get a head start on their adventure.ABOUT THE GAMESet out on a grand adventure in this turn-based, retro style, pixel-art RPG, inspired by the great titles of the 90's. Take on the roles of in-game players taking on the roles of their characters in a traditional pen and paper RPG session in the ultimate meta roleplaying experience.Taking on the roles of both the playing characters AND the dungeon master, players can choose which battles to fight. Put together a bunch of monsters to make for a challenging fight and your efforts will be equally rewarded! Choose from multiple classes, such as knights and mages, pick your characters to control those classes, like grandma or kid brother, and take on the loads of quests, monsters, items and equipment littered throughout Knights of Pen & Paper +1 Edition. Blacksmiths, enchanters, mining, gathering, hidden treasures and a whole lot more await, giving players a lot of room to personalize their gameplay experience.Don’t wait any longer, the Pen & Paper world needs you!KEY FEATURES The ultimate pen and paper RPG simulation experiencePut together your own role-playing group complete with the game master, the role-players and their respective classes Fight and explore your way through a perilous fantasy world to defeat the dark mageLevel up and get your hands on more gold to unlock epic items and gear for your partyAs the game master, you can set up the fights yourself and choose how many monsters to battleThe +1 Edition includes these all new features: New dungeons to explore with monsters, traps, treasures, and powerful bosses The Tavern, a place to stash heroes and switch out party members More options for characters to implement during battles, adding more depth and variation to fights Extended campaign filled with lots of new contentSYSTEM REQUIREMENTS Windows Operating system: Windows XP or later Processor: 2000 MHz Memory: 512MB RAM Hard disk space: 100MB HD space Video Card: 640x480 minimum resolution (Direct3D/OpenGL compatible card with at least 128MB) Sound Card: 2D sound compatible card DirectX®: 9.0cMac Operating system: OS X 10.4 or later Processor: 2000 MHz Memory: 512MB RAM Hard disk space: 100MB HD space Video Card: 640x480 minimum resolution (Direct3D/OpenGL compatible card with at least 128MB) Sound Card: 2D sound compatible cardLinux Operating system:Ubuntu 10 or later Processor: 2000 MHz Memory: 512MB RAM Hard disk space: 100MB HD space Video Card: 640x480 minimum resolution (Direct3D/OpenGL compatible card with at least 128MB) Sound Card: 2D sound compatible card © 2013 Paradox Interactive™. Trademarks belong to their respective owners. All rights reserved.